“That will be done both to protect the ruble and potentially to position the ruble as a reserve currency in the long-term, but also as a signal to Washington,” he said, adding that it’s almost like a geopolitical move showing that Russia has a monetary and financial alternative and it can retaliate if economic sanctions were to deepen. On Thursday EU foreign ministers decided to prolong sanctions against Russian officials and the militias in eastern Ukraine until September 2015, but decided against broadening the list of economic restrictions. A final decision is expected in February. “Increasing the share of gold in foreign exchange reserves is not a short-term speculation, it’s a long-term diversification,” O’Byrne said. 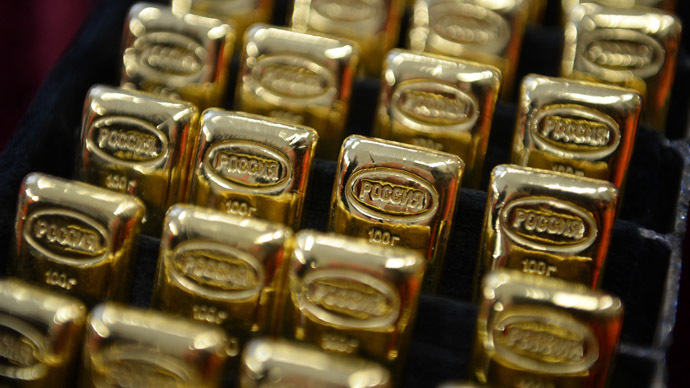 Analysts from GFMS partially attribute the increase in Russian gold purchases to the buying of the metal from domestic production that increased 9 percent year-on-year. At the same time, it won’t be easy to sell these volumes overseas due to sanctions, they say. The current spot price for gold is $1,263 per ounce which is below the recent five-month record of $1,300. The research forecasts that soon Russia may slow global gold purchase rates and enter the sales market to sell its reserves in order to support the national currency. During the crisis of 1998, Russia had to sell 118 tons of gold reserves to cover fiscal deficits. At the same time, the current situation is not as dramatic as Russian foreign exchange reserves are valued at $378.1 billion. “We are still a long way off Russia needing to sell gold,” said Turner. Russia was the second biggest gold producer in 2014.Last year it extracted 272 tons of gold, outstripped by China with 465.7 tons, and just ahead of Australia producing 269.7 tons.